EL from "ANVERS*10 JUNE 71" to "SYROS", fr. with 20c. and 30c. Belgium 1869-78 (Leopold) canc. with dotted "12" and cds "ANVERS*10JUNE 1871". Boxed "PD" crossed out and "AFFRANCATUR INSUFFIENT" x2 was added in Triest. 5l. green, 10l. orange, 20l. blue & 40l. 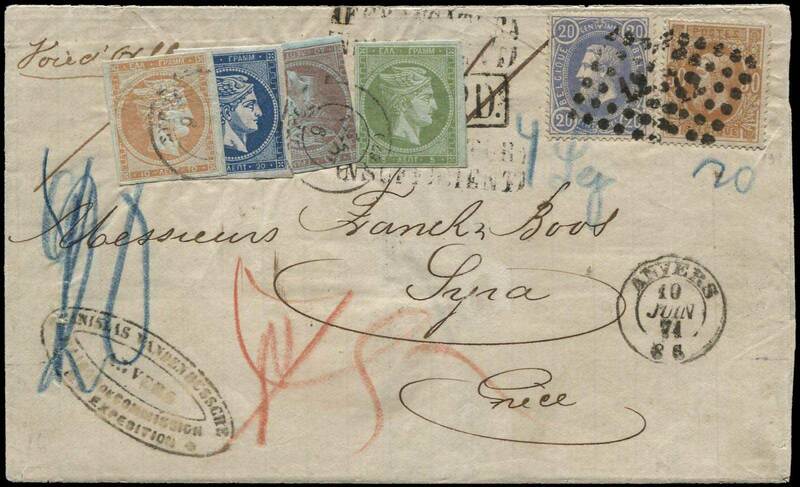 mauve on blue (Hellas 25a+26a+27a+28b) was added in Syros as postage due. Certificate by Peter Holcombe (1986). VERY RARE.